At the start of World War 1, German imperial troops burn down Reverend Samuel Sayer’s mission in Africa. He is overtaken with disappointment and passes away. Shortly after his well-educated, snooty sister Rose Sayer (Hepburn) buries her brother, she must leave on the only available transport, a tired river steamboat The African Queen manned by the ill-mannered bachelor, Charlie Allnut (Bogart). Together they embark on a long difficult journey, without any comfort. Rose grows determined to assist in the British war effort and presses Charlie until he finally agrees and together they steam up the Ulana encountering an enemy fort, raging rapids, bloodthirsty parasites and endlessly branching stream which always seem to lead them to what appear to be impenetrable swamps. Despite opposing personalities, the two grow closer to each other and ultimately carry out their plan to take out a German warship. John Huston made better, more powerful films than The African Queen, but none so universally beloved, on first appearance and over the decades since. In this adaptation of the C.S. Forester novel, Humphrey Bogart (who would win the best-actor Oscar®) and Katharine Hepburn costar as an unlikely pair thrown together in German East Africa during the First World War. He’s the gin-soaked skipper of what we might call the title character, a none-too-reliable steam launch chugging along the backwaters of the “Dark Continent.” Hepburn’s a straitlaced Methodist missionary who, following the demise of her bachelor brother (Robert Morley) and the burning of their village by Kaiser Wilhelm’s troops, determines that the Queen should be used to attack the Königin Luise, a large German gunboat patrolling a lake downriver. It’s an absurd proposition. Then again, John Huston and the absurd were always on familiar terms. Charlie Allnut (Humphrey Bogart): Well I ain’t sorry for you no more, ya crazy, psalm-singing, skinny old maid! Charlie Allnut (Humphrey Bogart): We can’t do that! Rose Sayer (Katherine Hepburn): How do you know? You never tried it. Charlie Allnut (Humphrey Bogart): Well, yeah, but I never tried shooting myself in the head neither. Charlie Allnut (Humphrey Bogart): I don’t know why the Germans would want this God-forsaken place. Rose Sayer (Katherine Hepburn): God has not forsaken this place, Mr. Allnut, as my brother’s presence here bears witness. Charlie Allnut (Humphrey Bogart): How’d you like it? Rose Sayer (Katherine Hepburn): Like it? Charlie Allnut (Humphrey Bogart): White water rapids! Rose Sayer (Katherine Hepburn): I never dreamed that any mere physical experience could be so stimulating! Rose Sayer (Katherine Hepburn): Nature, Mr. Allnut, is what we are put in this world to rise above. Captain of Louisa: By the authority vested in me by Kaiser William II, I pronounce you man and wife. Proceed with the execution. Rose Sayer (Katherine Hepburn): Dear? — ¦ Dear? — ¦ What is your first name? Charlie Allnut (Humphrey Bogart): [skitting Rose] Can you make a torpedo? Well do so Mr. Allnut. Rose Sayer (Katherine Hepburn): What do you mean? Charlie Allnut (Humphrey Bogart): I mean we ain’t goin’ to do nothin’ of the sort. Rose Sayer (Katherine Hepburn): Why, of course we’re going! What an absurd idea! Charlie Allnut (Humphrey Bogart): What an absurd idea! What an absurd idea! Lady, I may be a born fool, but you got ten absurd ideas to my one, an’ don’t you forget it! Charlie Allnut (Humphrey Bogart): [his stomach is growling] Ain’t a thing I can do about it. Charlie Allnut (Humphrey Bogart): You know why did the chicken cross the road. Rose Sayer (Katherine Hepburn): [missing the joke] I beg your pardon. Charlie Allnut (Humphrey Bogart): Nevermind, miss. Rose Sayer (Katherine Hepburn): Mr. Allnut! Mr. Allnut, you may come in out of the rain! Rose Sayer (Katherine Hepburn): Mr. Allnut? Charlie Allnut (Humphrey Bogart): Yes, miss. Rose Sayer (Katherine Hepburn): [after travelling through the rapids] Now that I’ve had a taste of it I don’t wonder why you love boating. Rose Sayer (Katherine Hepburn): [as Charlie tries to stop her from revealing their plan] Oh stop it, Charlie, we’ve been through all that. I’m certainly not going to outlive you and that’s all there is to it! Charlie Allnut (Humphrey Bogart): One thing in the world I hate: leeches. Filthy little devils. Rose Sayer (Katherine Hepburn): Dear Lord, We’ve come to the end of our journey, and in a little while we’ll stand before you. I pray for you to be merciful. Judge us not for our weaknesses, but for our love and open the doors of heaven for Charlie and me. Rose Sayer (Katherine Hepburn): Who do you think you are ordering me about? Charlie Allnut (Humphrey Bogart): I’m the captain, that’s what! Rose Sayer (Katherine Hepburn): [after Charlie checks the boat for damage after going down a rather rough set of rapids] Could you see anything, dear? Charlie Allnut (Humphrey Bogart): Yeah. The shaft’s twisted like a corkscrew and there’s a blade gone off the prop. Rose Sayer (Katherine Hepburn): We’ll have to mend it, then. Charlie Allnut (Humphrey Bogart): There ain’t nothing so complicated as the inside of a torpedo. Charlie Allnut (Humphrey Bogart): Let’s go while the going’s good. Charlie Allnut (Humphrey Bogart): Never say die. That’s my motto. 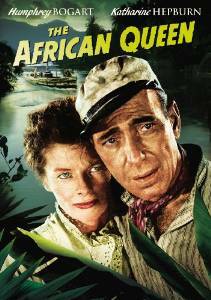 Charlie Allnut (Humphrey Bogart): Nobody in Africa, but yours truly, can get a good head of steam on the old African Queen. Charlie Allnut (Humphrey Bogart): What a time we had Rosie, what a time we had. Rose Sayer (Katherine Hepburn): Fancy me a heroine. Captain of Louisa: By the authority granted to me by his Imperial Majestey Kaiser Wilhelm the Second I pronounce you man and wife —  proceed with the execution. Charlie Allnut (Humphrey Bogart): It’s a great thing to have a lady aboard with clean habits. It sets the man a good example. A man alone, he gets to living like a hog. The first choices for the lead roles were John Mills and Bette Davis. The scenes in the reed-filled riverbank were filmed in Dalyan, Turkey. The female lead was originally offered to Bette Davis in 1938, with David Niven as Charlie. It was offered to Davis again in 1947, with James Mason, as Charlie, but she had to drop out due to pregnancy. By the time Davis tried out for the role again in 1949, plans were underway for Katharine Hepburn to star. This is the role that won Humphrey Bogart the only Oscar of his career. The Queen of Africa was played by the LS Livingston, which had been a working steamboat for 40 years. It is now docked next to the Holiday Inn in Key Largo, Florida, just off US Highway 1. Walt Disney used this film as the basis for the Disneyland’s “Jungle Cruise” attraction. To show her disgust with the amount of alcohol that John Huston and Humphrey Bogart consumed during filming, Katharine Hepburn drank only water. As a result, she suffered a severe bout of dysentery. In “The Making of ‘The African Queen,’ or How I Went to Africa with Bogie, Bacall and Huston and Almost Lost My Mind”, Katharine Hepburn described the first day of shooting. Five cars and trucks were needed to take the cast, crew and equipment 3.5 miles from Biondo to the Ruiki river. There, they loaded everything onto boats and sailed another 2.5 miles to the shooting location. Press materials and contemporary articles detailed the perils of shooting on location in Africa, including dysentery, malaria, contaminated drinking water, and several close brushes with wild animals and poisonous snakes. Most of the cast and crew were sick for much of the filming. In a February 1952 New York Times article, John Huston said he hired local natives to help the crew, but many would not show up for fear that the filmmakers were cannibals. Columbia originally bought the novel as a vehicle for Charles Laughton and his wife Elsa Lanchester. Instead, they made The Beachcomber (1938), which was same story, but a box office failure. And at one point David Niven and Paul Henreid were each considered for the male lead. According to United Artists press materials and John Huston’s autobiography, the director built a camp to house the cast and crew in Biondo, outside the town of Stanleyville. It included a bar, a restaurant and several one-room bungalows. Because the boat used in the film was too small to carry cameras and equipment, portions of the boat were reproduced on a large raft, in order to shoot close-ups of Humphrey Bogart and Katharine Hepburn. Interior and water-tank scenes were filmed in London, as were most of the scenes containing secondary characters. Robert Morley shot all of his scenes in London, including footage of him preaching, which was edited together with shots of the natives praying, which was filmed in Africa. James Agee suffered a serious heart attack during development of the screenplay. Uncredited writer Peter Viertel wrote the film’s final scenes with John Huston. Shortly after filming was completed, Belgian fan magazine Cine-Revue published an article allegedly written by Lauren Bacall, who had accompanied her husband, Humphrey Bogart, on location, which included behind-the-scenes photographs. According to a Mar 1952 Daily Variety story, Romulus Films protested the publication of the photos, which they said “dispelled the film’s illusion” by exposing private shooting information. Lauren Bacall denied having written the story. Berlin’s film trade union requested that The African Queen be withdrawn from the Berlin Film Festival because of its “anti-German tendencies”. In The Making of the African Queen, Katharine Hepburn details John Huston’s obsession with hunting. One day he convinced Hepburn to join him, and inadvertently led her into the middle of a herd of wild animals. They barely escaped. While filming the scene where Charlie finds his body covered with leeches, Humphrey Bogart insisted on using rubber leeches. John Huston refused, and brought a leech-breeder to the London studio with a tank full of them. It made Bogart queasy and nervous, qualities Huston wanted for his close-ups. Ultimately, rubber leeches were placed on Bogart, and a close-up of a real leech was shot on the breeder’s chest. Katharine Hepburn’s first color film. Lauren Bacall famously ventured along for the filming in Africa to be with husband Humphrey Bogart. She played den mother during the trip, making camp and cooking. This also marked the beginning of her life-long friendship with Katharine Hepburn. In 2007, the American Film Institute ranked this as the #65 Greatest Movie of All Time. According to cameraman Jack Cardiff, Katharine Hepburn was so sick with dysentery during shooting of the church scene that a bucket was placed off camera because she vomited constantly between takes. Cardiff called her “a real trouper.” In “The Making of The African Queen (1951)” Hepburn said she rushed for the outhouse only to find a black mamba inside, then ran to the trees. ‘The African Queen,’ built in England in 1912 was used by the British East Africa Company from 1912 to 1968 to shuttle passengers and cargo across Lake Albert (on the border between Uganda and Belgian Congo). It is now located in Key Largo. John Huston’s daughter Anjelica Huston was born in Ireland during filming. Humphrey Bogart’s part had to be substantially rewritten before filming since his character was originally a Cockney riverman, and Bogart couldn’t do a Cockney accent. “Lux Radio Theater” broadcast a 60 minute radio adaptation of the movie on December 15, 1952 with Humphrey Bogart reprising his film role. The ship used as the “Königin Luise” (called “Louisa” by the English-speaking characters, but by its full name by the German crew) was the “Liemba”, initially a German gunboat steaming (and controlling) the Tanganyika lake. Originally it was called the “Graf Goetzen”. The ship, almost 70 meters long, had been built at the Meyer Shipyard in Germany (now maker of some of the world’s largest cruise ships), but assembled on-site. The “Graf Goetzen” was sunk in June 1916 by its own crew to avoid capture, then raised by the Belgians, sunk again in a 1920 storm and was raised once more by the British in 1927, who renamed it “Liemba”. It is still in service on Lake Tanganyika. According to recent on-the-ground research in Britain’s West Country, the legendary riverboat ‘Queen Of Africa’ was built at the Abdela & Mitchell Brimscombe works in Gloucestershire between 1908 and 1911. Lux Soap sponsored a radio broadcast version of the script. Humphrey Bogart reprised his Oscar-winning role as Charlie and Greer Garson played Rosie. The broadcast is included in the DVD commemorative edition and also features a commercial for Lux starring Zsa Zsa Gabor. SPOILER: C.S. Forester wrote two different final scenes for his book; one was published in England, the other in America. In the more widely published American version, Rose Sayer and Charlie Allnut are turned over to British officers, who then blow up the Louisa. In the British version, the African Queen hits the Louisa and destroys it, after which Rose and Charlie walk down the beach to inform the British Army that the way is now clear. In a modern interview, Peter Viertel said that since he and John Huston wanted Rose and Charlie to be together at the final scene, and invented a way for them to be married on the German ship to avoid censorship.